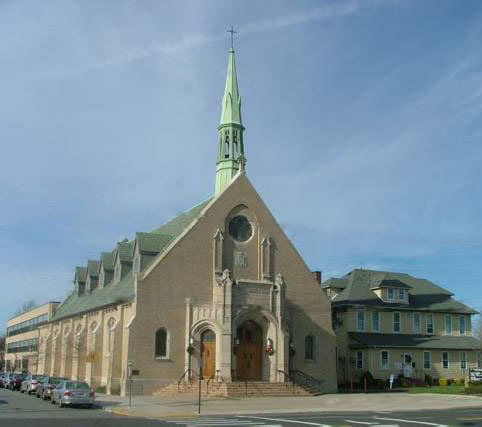 For more than 100 years, the Roman Catholic Church of Saint Catherine of Sienna has served as the spiritual heart of Franklin Square. Generations of families have been baptized, confirmed and married; and untold thousands have received their First Holy Communion at our parish altar. A small town of immigrants with strong faith not only built a town, but together created a faith community that has grown stronger and larger for generations. The story of our parish begins in the 1850’s when German immigrant farm families settled in Franklin Square and Elmont. As the majority of families were devout Catholics, the organization of a church by this community was not surprising. By 1908, the local people tired of traveling to Elmont and Hempstead for Sunday Mass, arranged for the first Holy Mass to be celebrated in Franklin Square on Sunday, July 5, 1908; it was held in the Kinsey Homestead, which would later become the Krauss Funeral Home. For the next five years every Sunday a priest came from the neighboring town of Hempstead to celebrate Sunday morning Mass at 10:00AM. By 1913, the faith community of Saint Catherine of Sienna had grown sufficiently to qualify for a full-time priest and was elevated to parish status by canon law within the Diocese of Brooklyn. It began with four men and their wives, all named Catherine, which many believe the name of the parish was so inspired. A parish community of eleven families started four ministry groups – Altar Servers for boys, Society for men, women and girls. The first pastor to serve this new faith community was Rev. Tobias Farrenkopf. The families raised the roof on the Saint Catherine of Sienna Chapel, a wooden framed church, in 19xx. The parish complex grew due to need of more worship and meeting space and more families became part of the parish through the years. In 1925 a new stone church was erected that would accommodate many more people with vision of future growth to come. The sacramental and spiritual life of our parish impacted many lives in yesteryear and continues to be a strong and integral part of our faith community today. Since 1957 our parish is in the Diocese of Rockville Centre. On donated land that was originally a field of flowers where that first wood framed church and rectory were built now stands our beautiful stone church with its steeple, the highest point in the town. Later came a small parish hall building, then a larger church, a school and a convent. 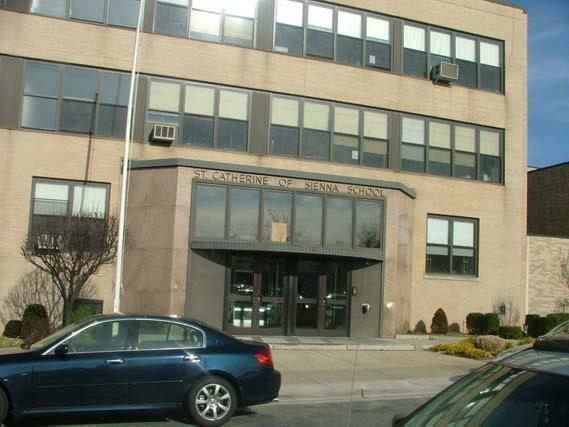 In 2004 the school and church were physcially connected by a parish center. Today from the Saint Catherine of Sienna R.C. Church one is led into the Msgr. Thomas W. Groenewold Memorial Sienna Center, blessed in 2008 by Most Rev. William Murphy, on the 100th Anniversary of the first Mass celebrated in Franklin Square. With the Saint Catherine of Sienna Chapel at its center, the handicap accessible building now connects to the Parish Activity Complex (formerly the parish school) which has classrooms filled with children attending religious education, an auditorium/gymansium for shows, plays, sports and the Faith Formation Office, the Parish Office, Welcome Desk and more. The original rectory still stands and houses our parish priests. The former convent that originally housed women in consecrated life now has a separate handicap accessible entrance to our Parish Social Ministry-Outreach Office equipped with small confidential meeting spaces and our Outreach Food Pantry at the east side of building. Our Adoration Chapel for perpetual Adoration of the Blessed Sacrament is located on the west side of former convent building and it too is handicap accessible. Today we are guided by Rev. Msgr. Richard M. Figliozzi, our pastor since 2008. We have two Associate Pastors, Rev. Allan Arneaud and Rev. Jerzy Bres; and assisted by one Priest-in-Residence, Rev. Emmanual Nartley, PhD. Our parish has two other men serving our faith community, Deacon Joseph Bennicasa and Deacon Frank Gonzalez. In addition, lay leadership is provided by the Pastoral Staff Team of Laity Leaders for Business Administration, Faith Formation, Social Outreach and Music MInistry along with volunteer leadership of our Parish Trustees, Finance Committee and Pastoral Council. Today we have over 4,895 households/families in our parish-wide family composed of residents in Franklin Square and surrounding towns. We are a Faith Community serving God by serving others through the many good works of mercy and ministry offered within our parish. In addition to the celebration of the Eucharist - the Mass - our work in parish ministry encompasses liturgy and prayer, outreach to those in need, preparation for sacraments, family activities for various ages and a variety of spiritual and social activities and events – all part of the spirituality of parish life. The core of any parish and Catholic Church is centered on the celebration of the Eucharist – the Mass. Today more than 150 volunteer lay liturgical ministers serve the Lord through their serving and participation before, during and after weekday and weekend Masses; and bringing Holy Communion to those in senior and assisted living residences, local hospitals and to parishioners that are homebound. The parish hosts a Parish Mission/Retreat annually with special activities during the Seasons of Advent, Christmas, Lent and Easter -- all are welcome! Saint Catherine of Sienna Faith Community has deep commitment to prayer through Adoration of the Blessed Sacrament. We have a Perpetual Adoration Chapel with opportunity for prayer in the Real Presence of Christ 24 hours a day. There are also special liturgical events with Exposition of the Blessed Sacrament and Benediction in our Church and Saint Catherine of Sienna Chapel throughout the year. In addition, Prayer-Devotion-Scripture Study and faith sharing groups meet regularly under the leadership of lay ministry leaders. And, a team of faithful ministry volunteers assist in our ‘In-Home’ Parish Prayer Program. This initiative includes a ‘Cup of Prayer’ focused on daily prayer in the home praying for vocations to the priesthood and the ‘Pilgrim Statue of Our Lady of Fatima’ focused on daily recitation of the Rosary and family prayer; both travel separately on a weekly basis to different homes with the parish. Our Faith Formation continues to grow as we serve over 1,000 children annually in classrooms Mondays thru Thursdays and support adults in their formation through such programs as Mary Matters, Faith Conversations for Parents, and Rite of Christian Initiation for Adults throughout the year. We also have adults serving those preparing for their sacraments including Pre-Cana for those to be married; and baptism preparation classes for parents of children they wish to be baptized. Our parish ministry touches thousands including senior citizens, parents, married without children, singles, young adults, teens and children through a wide variety of parish social family style events including one of the largest - SCS Annual Family Festival & Feast - in the town of Franklin Square with the famous 'Dancing Giglio' of the Sons of San Paolino. Volunteers in our parish social ministry reach out to those with special needs, those in need of assistance and help many in our local community through our parish food pantry. We have an active youth ministry for children, teens and young adults served through a variety of programs such as our Morning Star Youth Ministry and Catholic Youth Organization (CYO) sports programs including basketball and volleyball under the guise of volunteer adult sport leaders. Our parish social life has spiritual roots and brings families, friends and neighbors together not only for our Annual Family Festival and San Paulino Feast but also our Community-Wide Interfaith Thanksgiving Eve Service and other parish-wide family and community oriented activities. Much may have changed through the years … the buildings may be a bit different, the leadership may consist of new faces, the people are more diversified in culture and ethnicity; but one thing remains the same ... the parish of Saint Catherine of Sienna is still an active, vibrant and essential part of the community with THE EUCHARIST at its center, the source and summit of life.